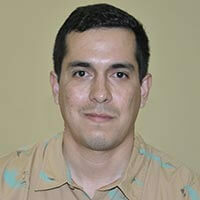 Alejandro Ortega-Beltran, a Mexican, has assumed the position of Plant Pathologist at IITA-Ibadan. He obtained his BSc in Biotechnological Engineering from the Institute Technological de Sonora (Mexico) in 2006. He obtained a PhD on Plant Pathology and Microbiology from the University of Arizona (United States) in 2012. He worked as a postdoctoral scientist at the University of California, Davis, on various projects including improvement of aflatoxin biocontrol technologies for use in the almond and pistachio industries in California. He is currently working on developing improved aflatoxin biocontrol technologies and expanding their use across Africa to reduce both aflatoxin accumulation in staple crops and human exposure to these potent carcinogenic toxins. Prior to this appointment, he was Postdoctoral Scholar at the University of California, Davis – Kearney Agricultural Research and Extension Center.